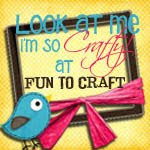 A blog devoted to all my crafty endeavors. The chilly and crisp air is definitely upon us. 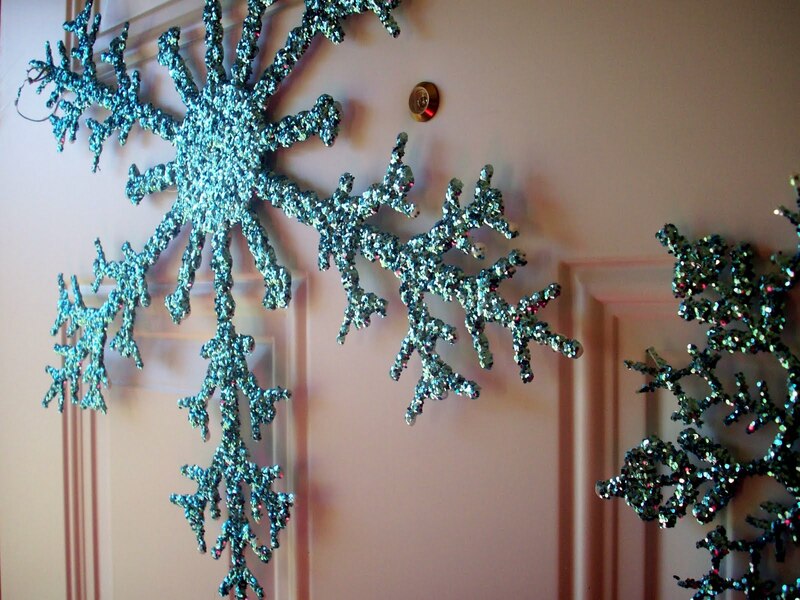 I enjoy celebrating the changing seasons, so for winter I chose these easy sparkly snowflakes for our front door. My photos are not detailed but this project is easy and inexpensive. 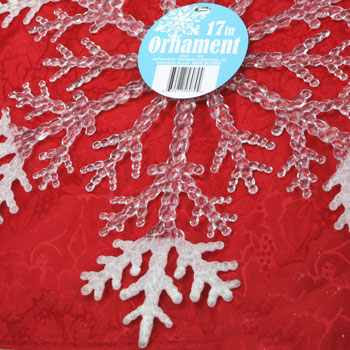 All you need are these clear acrylic snowflakes you can get from the Dollar Tree. The large ones are a dollar and the smaller ones come in a 3-pack. First I spray painted the snowflakes white. Spray painting them white is not necessary I just think colors appear more vibrant when they have a white base underneath. Use any type of glue, I had Tacky Glue on hand but any spreadable glue should work. *I first tried spray on glue but that doesn't give a good coverage for the glitter so I recommend brushing on thick glue. I used a few different brands of glitter in three different shades of blue. I don't think it matters what kind of glitter you use, just pick out whatever color scheme you're going for. 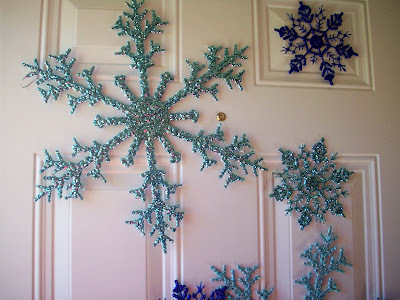 I worked on one snowflake at a time and shook on the glitter and let dry. To hang, I used double sided foam sticky tabs. However, some of my tabs did not hold up. My front door faces south and I guess the sun heated up the stickiness a bit and the snowflakes fell, so I just used a hot glue gun to attach the snowflake to the sticky tab. These really are cute. I love dollar store projects. You know I seen these in the dollar store, gut just pasted up. Here's hoping you'll share your project over at Sunday' Best. Sharing is a good thing. Now following you. that is fabulous! 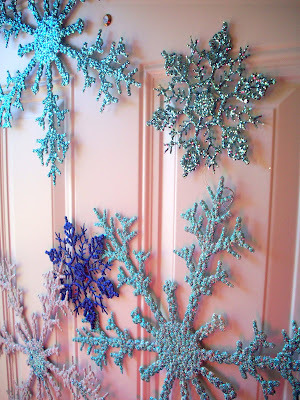 i love the whimsy and the sparkle, and most of my decorating i try and keep "winter" not so much "christmas," so i truly appreciate this. well done! Oh, WOW! I loooove anything glittery and sparkly. They look beautiful! Would you link them at my party? Pleeease? The snowflakes are so pretty! Who new they were from the dollar store? Great inspiration! Oh my! Found you via Clean and Scentsible and your project jumped out at me. I love this, very creative! I'm going to the Dollar Store today! I love this! Such a cute idea! I love the colors you chose!! Oh my, I'm in love with this project!!! I saved this to my Christmas file. Love the colors and sparkle! I'm your newest follower! Stop on by sometime! These I absolutely love, I love the colours, the sparkle, the glitter, the shape, everything. This is cute! You know I dont know where I will find these...here, finding everything is so difficult, but I love this :) Absolutely. Cute and unique idea, thanks for sharing! Oh my gosh this looks soo cool! I love it! So glad you linked these to Shine On Fridays! Have a great weekend! This is such a great idea! It's so pretty!!! Gorgeous and love the color you had used! 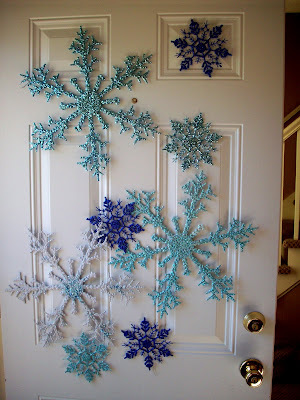 Jalinda I hope you don't mind I am featuring your Snowflakes this week at my blog and I created a door hanger from your inspiration. Love the colors you used on these. It must be a popular post with Frozen having come out and being so popular! Hi! I'm Jalinda between working FT and raising my wonderful daughter and our funny cat Fluffy, crafting takes up a great part of my life. 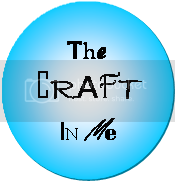 I have been a crafter ever since I can remember but only recently started blogging to join the huge world of crafters, sharing and exchanging craft projects and ideas. It's funny how I can bounce around so many craft mediums, nothing can hold my attention for too long, and besides, there are just too many crafts that I've just got to get my creative hands into! Pottery is my other obsession. For over ten years I've been making wheel thrown pottery.